There are a lot of rock slider options out there. I went with RSG Metal Works out of Colorado. 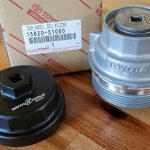 I will cover my reasoning for this choice, the options, and features, my experience with the vendor and the install on a 2018 4Runner TRD Off-Road (no KDSS). True confession, this was my first set of rock sliders. There are not a lot of rock obstacles where I live, but I plan on hitting some other trails out of town, like in southern Utah this summer, so I made the leap. I chose the RSG bulletproof angled slider with the top plate and powder coat. I had only read good comments about the company and product. I also liked that the products were generally already built and ready to ship. It was nice to have some options to choose from, as well. My logic for the top plate was to make a bit of a step out of it for people and pets (this is $100 extra). I like the look of the angled slider better and it gives you a little more clearance. As far as the powder coating (also $100 extra), I was kind of on the fence but went with it and it does look spectacular. My only concern is having to touch it up and repaint it later once it is scraped and scratched. If you plan on scraping these on a regular basis, you might want to consider the bare metal and just paint them with some black Rust-Oleum or similar product. I think this would be much easier to repaint and keep looking nice and new than trying to touch up powder coat. They are rock sliders, so you might not be too concerned if they show some battle damage. I appreciate the options provided and am very pleased with the final product I received. Ordering and shipping were professional and quick. I ordered one day, the sliders were shipped the next day and I received them in two days. From the day I ordered them, they were in my garage three days later. Shipping cost was $108 for my order, but this can vary by your location. With the FedEx shipping, I was able to divert the shipment to a FedEx office where I could pick them up at my leisure, no worries about being home for the delivery that way. RSG sent texts and e-mails every step of the way and provided a FedEx tracking number. They came in two separate boxes with the packing materials you can see in the picture. One of the two shipping boxes will be labeled with a hardware sticker. That slider will have 23 13mm bolts taped to the slider. You can see what the bolt looks like in the picture above. 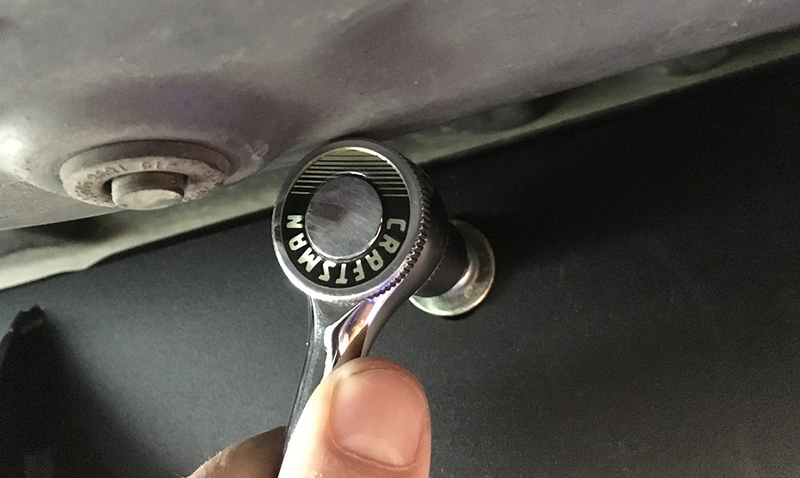 The shorter 12mm bolt is the bolt you will remove from each side before you start the install. They are holding what I believe are brake lines. Whatever it is, it needs removed and then later replaced during the install. This can be viewed in more detail in pictures below. The only tools you will need are a 12mm socket, 13mm socket, and a socket wrench. Pretty much the first step, besides washing off the area where the slider will bolt onto the frame, is removing the above 12mm bolt from each side, as the slider will slip under this clamp and then you will bolt it all back together with a 13mm bolt once the slider is in place. 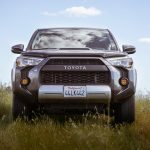 The 5th generation Toyota 4Runner comes with pre-threaded holes in the frame to attach running boards, nerf bars and rock sliders with relative ease. The RSG sliders are made to line right up with the factory holes in the frame. The best method to get started would be to have a buddy hold one end up, while you get a couple bolts threaded in the other side, then move over to the other side and thread a couple more bolts in to secure the other end. 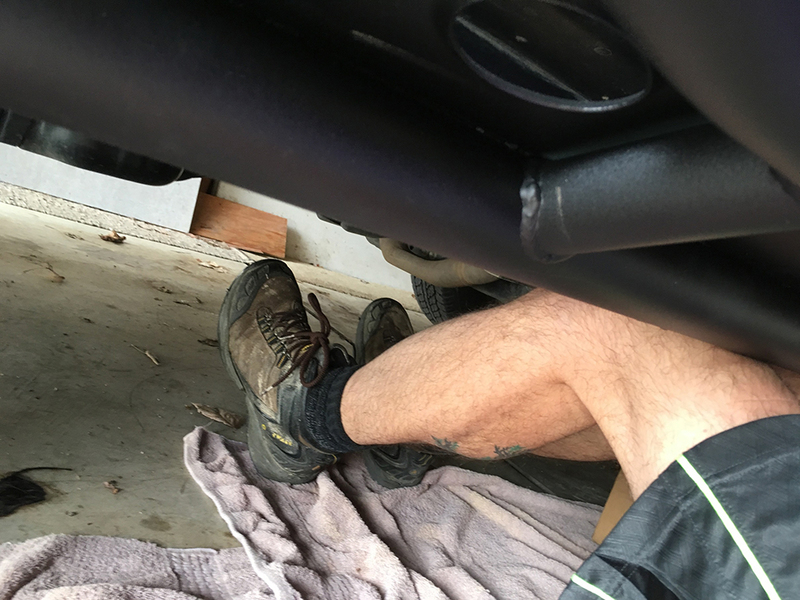 If your buddy doesn’t answer the phone, you can hold one end up with a sturdy box, jack or some other strong object, then use your leg to hold the other end up while you get those first bolts started. Whatever method you use, be careful, it is pretty heavy. You don’t want to injure yourself, or the rock slider paint job (yet). There will be 12 bolts on the driver side and 10 on the passenger side. Place the smaller locking washers on the bolts first, then the larger flat disc washers on bolts. Put a couple bolts in on each side of the slider into the frame to keep it supported while you bolt in the rest. Leave them all just a little loose until you get all the bolts threaded in, then you can tighten them all the way. I chose not to use Loctite at this point as I plan to let them settle in and then tighten them a little more in a couple weeks. I really think that will do the trick. If I am proven wrong, I can always go back and hit them with the Loctite. Again, you will replace the 12mm bolt holding (what I think is) the brake line on each side with the provided 13mm bolt. You can see the completed brake line re-attachment with the clamp in the picture above. This will take place on both driver and passenger sides. There are a few bolts on the top end of the sliders that are a little tricky because of limited space. A large socket wrench is likely to hit the body of the truck and not let you line up to the bolt. I used a smaller socket wrench on theses, which did squeeze in there (see picture). You could use a standard wrench or a crescent wrench also. It’s not horribly tight up there, but you might have to switch to a different tool to get those top bolts in, so don’t be surprised. The driver slider has a huge cut out that I believe is to install around the KDSS system, as I see no other reason for it. You can see the large gap provided in the slider in the picture above. This picture also highlights the supports on the slider that are covered by the top plate. 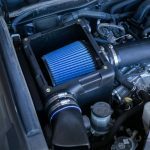 If you have the KDSS suspension, feel free to comment on how that affects the install. I imagine you might have to remove a few more bolts and re-install them, similar to the brake line clamps. INSTALL – YOUR ALL DONE! That is it, as far as the install! Even if you are not overly mechanical or handy, this is a pretty straightforward install. 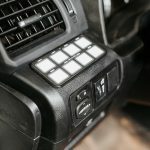 You should be able to do it yourself and save some money for you next mod. The top plate makes a nice platform to use as a step. My wife is 5’ nothing, so she can use it in combination with the grab handle to pull her self into the truck. 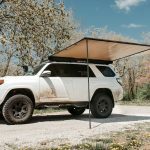 It also makes a nice step to access the roof rack. You will want the door open so your knees have room while standing on the platform to reach the roof. The kickout with the top plate makes an excellent step for the back seat. Whether it’s a kid or a dog, the plate is wide and makes a nice platform, preferably used when not caked in mud. On a side note, these like probably any other rock sliders, are going to be mud magnets. It’s not a huge deal, but just know the tires will kick mud onto the top of the sliders. If you live on a gravel or dirt road, you might want to really think this through, as it could be annoying as your everyday driver. If you live on the pavement, I don’t think it will be much of a concern, just an occasional wash. The kickout extends out past your rear tire to protect your rear quarter panel when driving around large rocks. Even with the angled sliders and using negative offset wheels or slightly larger then stock tires, the kick out should extend past those back tires (see picture above). 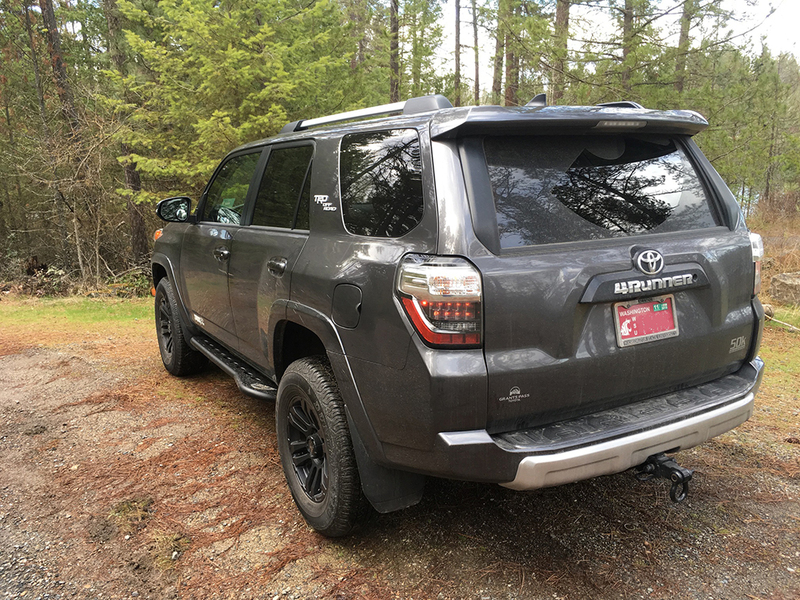 From this side view, you really don’t see the top plate, they look the same as an open slider and they tuck up nice and close to the 4Runner, leaving lots of clearance and protecting those rocker panels. 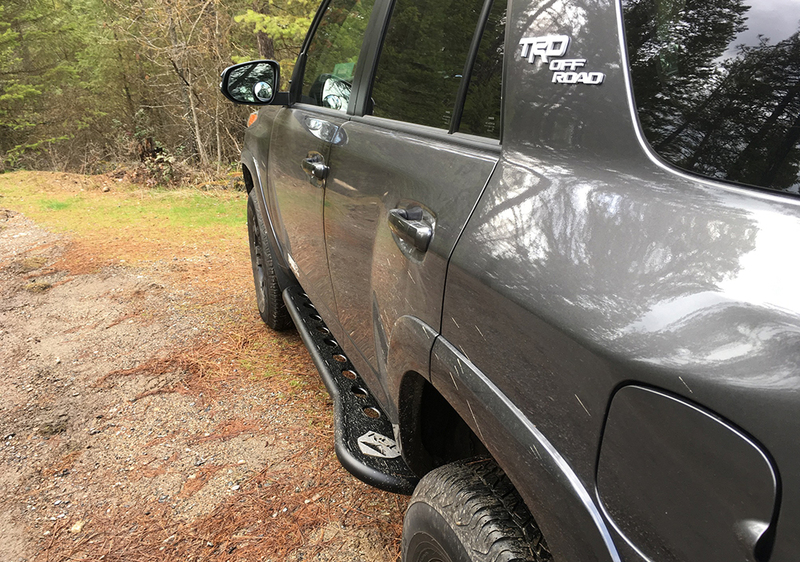 RSG bulletproof Rock Sliders fit on all 2010-2018 Toyota 4Runners with or without KDSS. They offer several configurations to fit your style and needs. Prices range from $599 to $799. Occasionally they will offer a promotion code for $100 off any pair of sliders. They generally have all versions built, in stock and ready to ship. 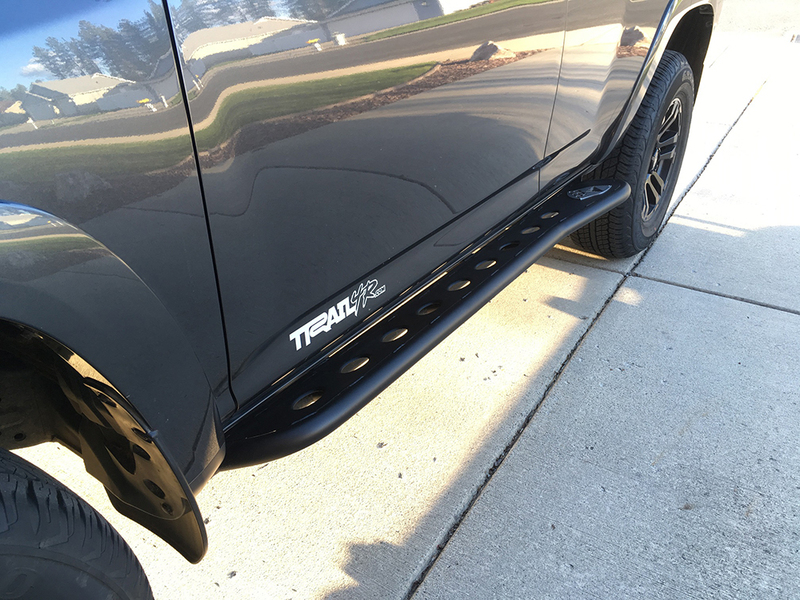 Rock sliders are a major purchase with whatever brand you choose and will cost you plenty of coin. Check out your options and do your research, but I can tell you my experience with RSG was phenomenal. The product is just well put together and thought out, the inventory is good, communication was great, shipping crazy fast, install had no surprises and I couldn’t be happier. Check these out as you shop and make your purchasing decision. Enjoy those trails! Any Questions or Comments, leave them below. Thanks, everyone! 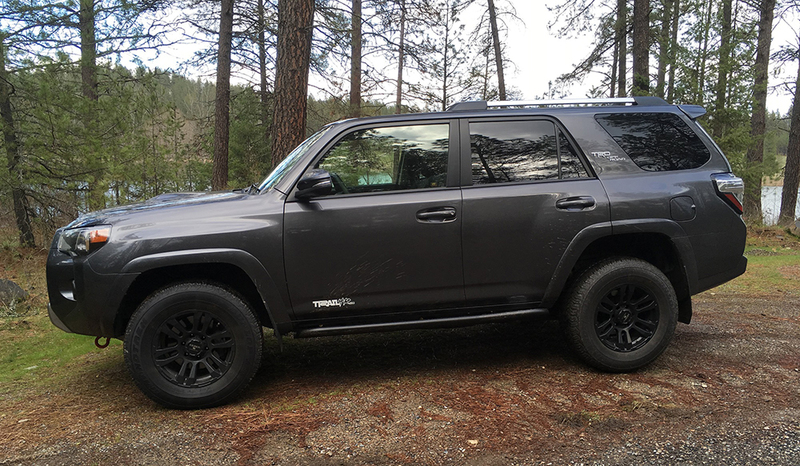 I have a passion for long distance trail running and any activity in the forest, including a little off-roading in my 4Runner whenever I can. I’m a strong believer in taking the path less traveled. I’ll tell you right now, I thank you for posting this. RSG wasn’t coming up in my previous searches. I have a detailed excel sheet I’ve created for sliders over the past year, comparing features and prices and company info… but I haven’t pulled the trigger because I couldn’t find something that satisfied all requirements. Now, I’m an overly conscious consumer. 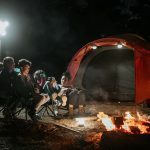 I’d rather, and often do, spend a little more with companies that I can really stand behind when it comes to their product, practices, and customer service. RSG so far is delivering on all fronts here. I placed the order which I was beginning to wonder if I ever would, and left a comment/ request when ordering on their site. I got a phone call minutes afterwards. This was past 8pm. A freaking phone call. Jason from RSG wanted to clarify my request and politely inform me that I’m an idiot by choosing in store pickup when I live about 18 hours away. He was very cool and when I thanked him sincerely he mentioned how their angle is to do something different which is offer great and sincere customer service along with great products. Well, he nailed it. As long as the product is as good as Jason was with his customer follow up, I’ll be singing praises. But thanks to you also for bringing RSG into my narrow depth of field, John. I appreciate the detailed write up and you were 100% accurate on the “great communication” part. Thanks for the kind words. Glad the write up helped you in your search and you are having a great experience with RSG so far! I think you will like the product just as much. I’ve been getting very positive comments from my friends who have seen the sliders installed on my rig. Checked the bolts a couple days ago, still fully tightened, so still thinking the Loctite not necessary. If you get a chance, would love to hear which options you ordered on the sliders. Good luck with the install and enjoy! Just installed the same sliders my TRD Off Road, however mine has KDSS. It is actually kind of a pain, it requires a bit of trimming on the lower KDSS skid plate. I had to go out and by a grinder that could handle this. I haven’t seen any install videos or instructions for this, maybe I should post mine. I believe RSG isn’t the only slider with this issue for KDSS vehicles. Thanks for the added info on the install with KDSS. Sometimes I kick myself for not getting the KDSS and other times like this I’m glad I don’t have it. I wound up upgrading to the Bilstein TRD Pro Suspension which has been great, but I know the KDSS has its advantages. Curious if those KDSS skid plates you had to trim are factory plates, or after market plates you added? Also, how was the rest of the install with the KDSS and how do you like the finished product? Yeah I’m happy with the KDSS system so far, looking to upgrade the shocks and springs soon as well. Yes, there are 2 factory KDSS skids, I only had to trim one of them in order to be able to bolt it back on. 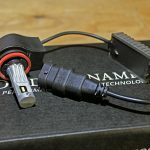 I’ve heard you need to do the same thing to install C4 sliders as well. Other than that the install was easy. And the product is great, the sliders are very well built, hopefully my original comment didn’t seem like a disliked the product, I love it. Nick, if anything you’ll probably end up very happy you have your own grinder now too. I couldn’t imagine not owning at least one myself – but then again, I’ve been wrenching and fab’ing for two decades now. This write up and install has helped me make my final decision on sliders. Thank you for a detailed, awesome write up! RSG all the way! 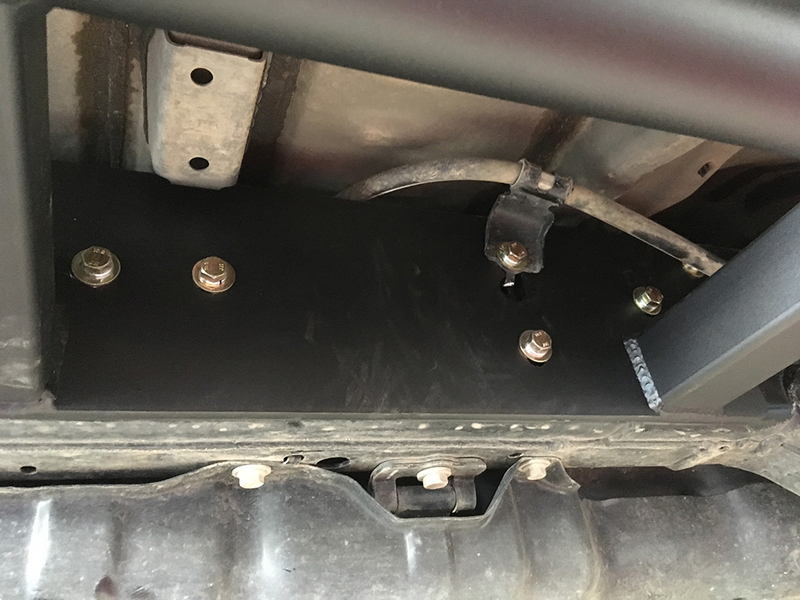 RSG now has an aftermarket KDSS skid plate that replaces both factory KDSS skid plates. Fits perfect with my RSG rock sliders. 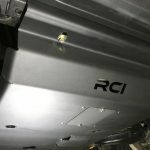 Only difference on installing the Rock Sliders when have a KDSS system is having to unbolt the clamps that hold the KDSS hydraulic lines to the frame and slide the rock slider bracket behind them. A little tight but I used a floor jack and jacked them right into place. I like the angled ones better too. Would the flat ones have been a better step for the wife and doggy? Update on the dog step. One of my 10 pound dogs is jumping right up on the top plated kick out to get in the back seat now, even with the angle. There are no holes there and it’s nice and wide with the kick out, so working perfect!! The Angled has been no problem for my wife. She steps on the tube while grasping the grab handle and goes right in. If she were to ever slip, I feel better that the platform is there to stop her form sliding through. All of our dogs in my life (four of them) are 15 pounds or less. 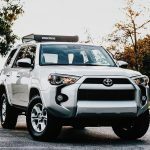 They generally ride in our older rig, but when they have gone in the new 4Runner, they honestly are a little hesitant to jump on the slider. I think they are so short, combined with the angle, they are not able to see the top of the slider, so are hesitant to make the leap. They will do it with some coaxing, and I bet they would be good with it after a while and not even thing about it (they just haven’t ridden that much in it and I’m usually in a hurry and just pick them up and toss them in). But I’m guessing they would be more apt to jump on the flat one, where they can see the platform better. Or I would think a bigger dog that could see the top platform would not care about the angle. I have heard of people using black grip tape on their sliders for pets and people, so that is something you could think about also. The powder coat held up to some wicked branches I rubbed against the other day (wish I could say the same for my paint on the truck), so was happy with that performance. Also, the angled sliders do make a great step and height for accessing the roof of the truck. Sorry this is not a more definite answer on the pet portion of your question, but hopefully it helps you a little with your decision. Thanks for the great writeup! These look super stout, but I understand they use HREW tubing rather than DOM. Any concerns about strength because of that? Seems like these would check every box for me if they were DOM. Shoot me an email if you’re still in need. Thanks Jason. I ended up getting a set of your angled sliders with kick out in HREW which I really enjoy! They are definitely stout and look great as well. To be honest, you may know more about the materials then I do, but from what I understand, the DOM tubing is stronger, but also considerably more expensive and the HREW tubing is plenty strong on sliders for normal off-road use. Where I live, I am much more likely to slide on a downed tree or a dirt mogul, then a rock, although there are a few rocks around. I really bought these as more of an insurance policy to protect my rocker panels and to be used as a step, although they certainly feel and look like they could take some abuse. I am not nervous about hitting some rocks, but I am also not seeking them out. So I guess it depends on your intended use and your pocket book. 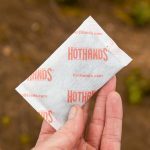 For me, these will be more then I ever need, but if you are sliding and slamming down on rocks every weekend on more aggressive trails, it might be a factor. But for most, I think these will be plenty durable. I was just out at the an OHV park yesterday with a friend who has steps instead of a slider. I definitely have more clearance and don’t worry about a slide on the rock rails at all, where he has to pay attention not to rip off or bend his steps. Been really happy with my RSG sliders. Good luck with your research and your purchase! 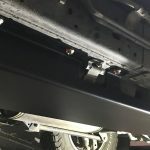 Do you have a lift on your 4runner and spacers as well? If so, can you share more about that? I’m looking to make some mods to my ’17 Trail Edition w/ KDSS. Thanks! Nice! What size tire are you currently running? I just got my black rsg silders. I gotta say I’m pretty upset. The non kdss side bolted right in like 15 mins and done. The kdss side I figured was going to be a issue. But it went up into place with some wiggling. But now I had to remove the slider and drill out the top holes and a bit on the bottom to get this to fit correctly . Not too happy but it is what it is. I have a 4Runner with KDSS and am thinking of purchasing these RSG sliders. Can you be more specific about what didn’t fit correctly. I’m not a mechanic and I’m wondering if I can even tackle this. The drivers side requires you to take off the bolts for the kdss and slide the slider between the frame and kdss. Not super difficult but mine was a bit. I had another friend buy them and his went up and in no problem. Maybe I just got lucky because alot of people dont have the same issue I did. Also the company will work with you if something is not going together right. Great write-up. 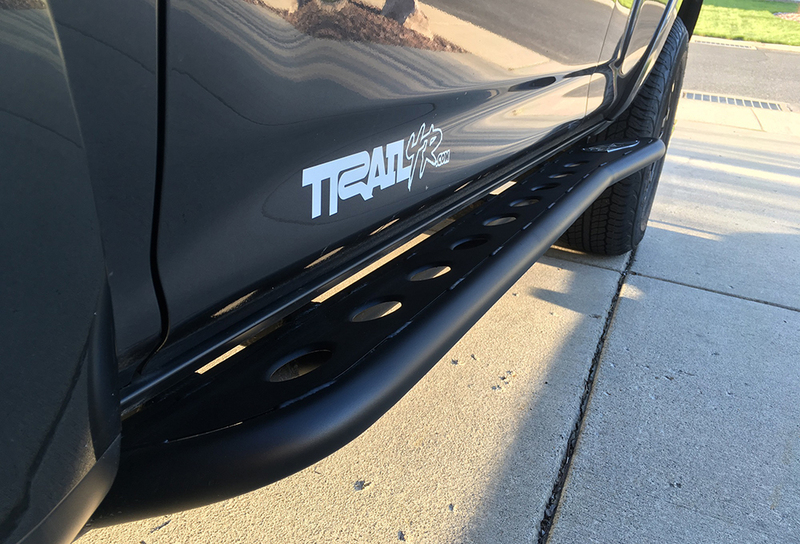 I just purchased a 2019 Trd off road and am seriously considering these. I love the way these look and would rather spend the extra to get real protection. These would probably be used more for a step than an actual slider. I mainly run fire roads and some light trails but no rock crawling is realistically in my future. I have had a Gen 3 since 2001 and never did it. This is my daily driver/weekend warrior vehicle and for purposes of travel in snow and gravel for the most part. My question is would the flat version make a big difference in the usability as a step? 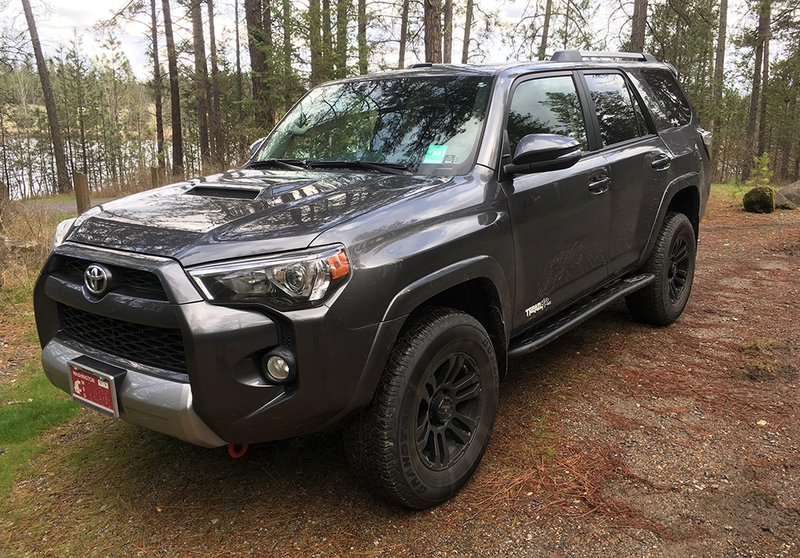 Hi Mark, You will love that truck; I have the 2018 TRD off-road with some modifications. 1st of all, I have zero regrets about the RSG rock sliders. They are solid, look great and work great. I’m not a heavy rock crawler either, I am mostly on trails and more likely to rub them on a fallen tree, or a mogul of dirt or Ice, then a rock, but I feel confident they could handle any of the above. 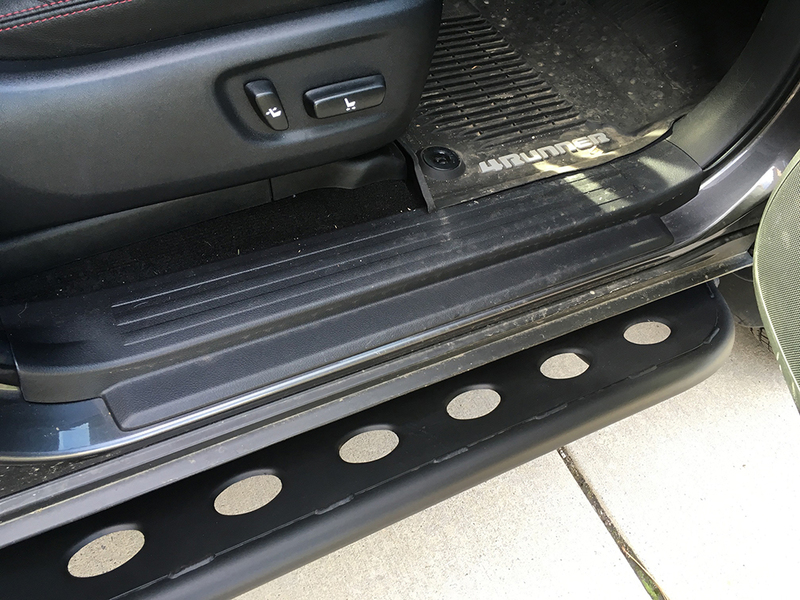 I do notice the extra clearance I have with the sliders compared to my friend with a Tacoma, equipped with the Predator steps. He drags much easier than me and has to pick his lines more carefully. About your question. 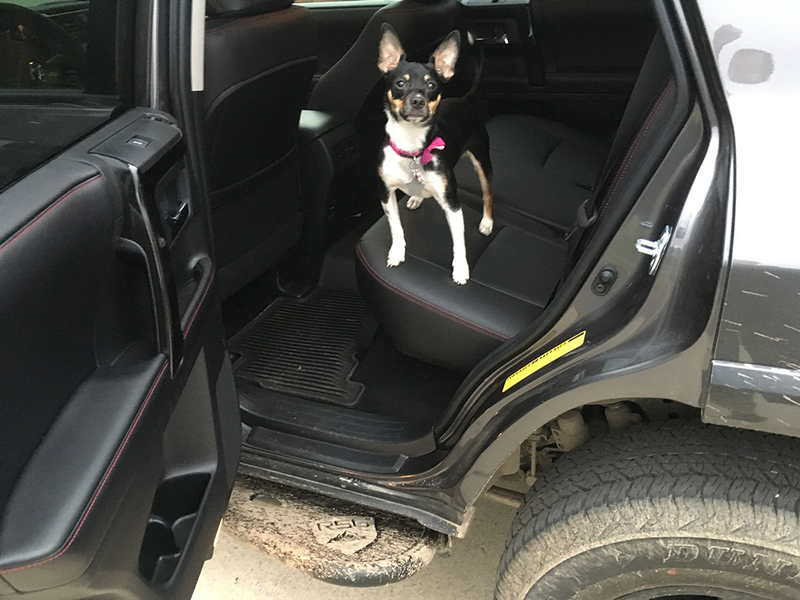 Our little dogs have figured out the angled kick out and can jump right up on it to help them get in the back seat. As far as people, they don’t really know what to make of them and usually step over the angled sliders, even though I tell them they are fine to step on. I would imagine the flat sliders would look more inviting as a step then the angled. They would also be more sure footed I would think. I have heard of people putting black grip tape on them as well, for when they are wet. The angled (and I’m sure flat as well) have worked awesome for accessing my roof. My personal preference is the angled, but if you are really trying to make it a more friendly step, I would recommend the flat. Either way you can’t go wrong. I did pay an extra $100 for the top platform, so that it would make a better step, especially for the pups. Good luck and have fun with that truck! Thanks for the reply John. I love the truck. I drove a Gen 3 for almost 10 years and then passed it to my boys. We still have it and also a Gen 4. Their awesome vehicles. That helps a lot in my decision. I prefer the angled sliders too but I’ll go with the flat with top plate to be more practical. I still think those look really good also. RSG seems like a really solid company. Appreciate all your write-ups. They are really helpful with the mods I have planned. OK. I ordered my rock sliders with the powder coating and after waiting out the lead time they are on the way. 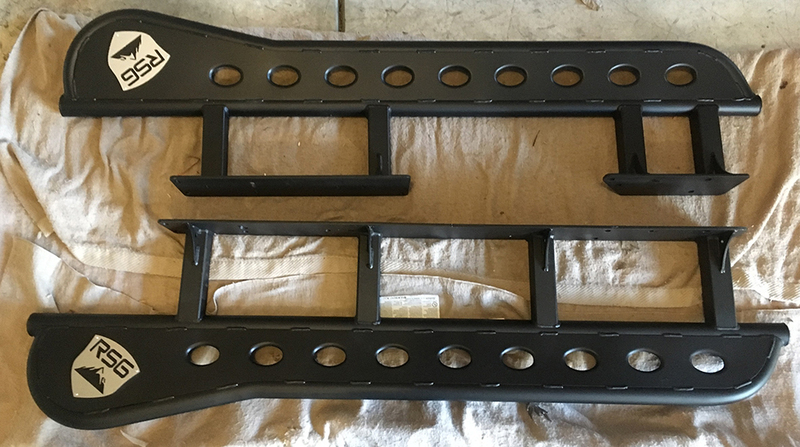 Through research on the web many have said that the plastic plugs on the frame need to be removed in order to allow the slider to be as flush as possible to the frame. 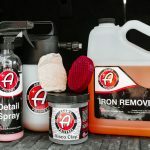 It is suggested that this can prevent water, debris, dirt, dust etc from causing rust where they are mounted. Others have suggested using sealers or fluid film treatment but there is no definitive solution that I see other than regular checks (yearly) and treatment to lessen the chances of rust from abrasion or debris being trapped between the mounts and the frame. This may all be a little overkill unless you are in the rust belt ( I am not). John, did you you remove those plugs? 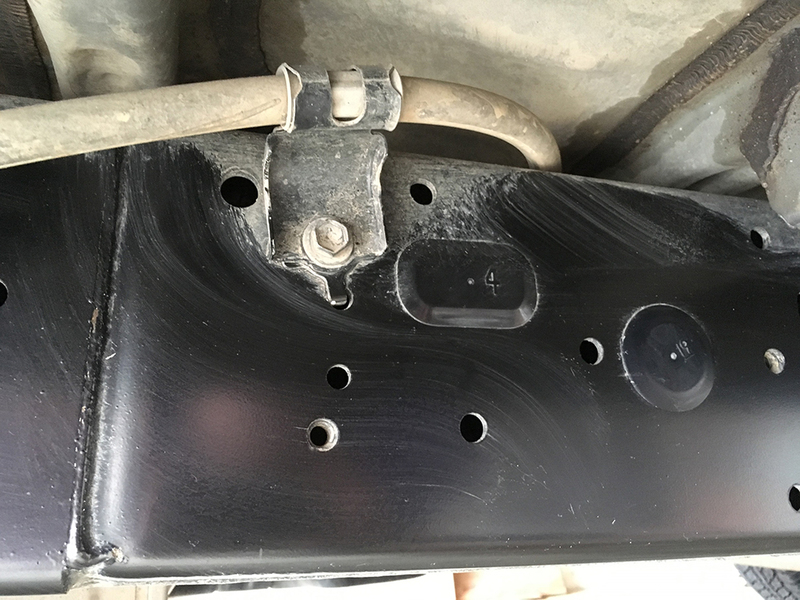 They are shown in the picture with the brake line visible. Does anyone have any suggestions or experience with coatings or is regular maintenance really the best solution. Maybe Jason can chime in. 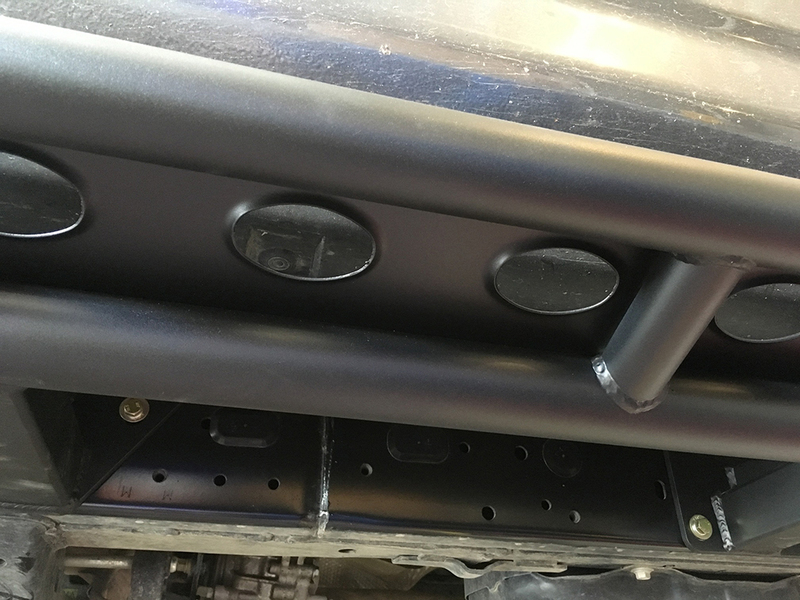 We install the sliders over the plugs and leave them in the frame. It’s really your preference if you want them there or not. We have yet to see any issues with leaving them or removing them. Mark, I debated about this exact question a little. On one hand, I thought I could get the sliders a tiny bit more flush with the plugs out (although they get weirdly pretty flush with them in). On the other hand I figured those plugs were there for a reason (Maybe to prevent Rust?). In the end, I left them in. Not sure if I can advise either way, but thought I would share my thought process. So far everything has been great. Good luck with the install! Mine have been backordered. Didn’t find out until after the order was placed. 3 weeks later, still waiting. Not a huge pain, just wanted to give another response on timing as most folks said shipped in 24 hours. Bare Metal sets are 3-5 Days. Just received and installed my new RGS rails. About seven weeks with shipping for the powder coated at this point. Customer service as top notch and they always kept me up to date. I know that they recently added onto their shop and that put them behind, so I am sure those delays will start to taper off. Definitely a great looking product, and overall I’m very happy with the purchase. It took me about 4 and a half hours to put them on. I know that part of that is that I’m a little type A when it comes to stuff like this, the other time drain was that I cleaned out each of the frame holes that the bolts thread into with some brake cleaner and some Q-tips because of all the mud and grit from previous outings. I wanted to use some blue lock tight for the bolts and also didn’t want to take any chances that I would damage the threads as I put the bolts in. For installs with the KDSS you only have to remove one small guard and cut off about a 1/2 inch deep at about 2 1/2 inches long portion to accommodate the rail. This was not overly difficult, however, I would HIGHLY suggest that you have a bench mounted vise for this. I did not and had to use vice grips while holding onto the cutting tool in the other hand. It is thick metal, and if I had to do it again probably should have just stopped and taken it to a shop with a vise because you are trying to cut through thick metal with a cut-off wheel about 6 inches from your hand. Complete stupidity on my part. KDSS rail installation definitely takes two because the KDSS lines are factory formed to hug the existing frame. Don’t forget to buy or use a torque wrench 24lbs on each bolt. Got one for 29 dollars from CARQUEST. Also, used some jack stands to help position it in place. I should point out that one of the bolt holes wont take their upgraded bolts because it is too long and once you get the rail up it wont clear the KDSS tubing. Therefore, I used one of the old bolts that came out off from the brake line and was able to angle that bolt up and in since it was shorter than the one they provided. I thought it was better to have a bolt there than not, even if it’s not as strong. For people that a have a wife or kid, I suggest the top plate. I would seriously worry about my kid’s leg slipping through the open kick-out tube and causing some damage. I bought the up-angle and like the look.